For other uses, see Bell tower (disambiguation). "Campanile" redirects here. For other uses, see Campanile (disambiguation). A bell tower is a tower that contains one or more bells, or that is designed to hold bells even if it has none. Such a tower commonly serves as part of a church, and will contain church bells, but there are also many secular bell towers, often part of a municipal building, an educational establishment, or a tower built specifically to house a carillon. Church bell towers often incorporate clocks, and secular towers usually do, as a public service. The Italian term campanile (/ˌkæmpəˈniːliː/; Italian pronunciation: [kampaˈniːle]), deriving from the word campana meaning "bell", is synonymous with bell tower; though in English usage Campanile tends to be used to refer to a free standing bell tower. A bell tower may also in some traditions be called a belfry, though this term may also refer specifically to the substructure that houses the bells and the ringers rather than the complete tower. The tallest free-standing bell tower in the world, 113.2 metres (371 ft) high, is the Mortegliano Bell Tower, in the Friuli-Venezia Giulia region, Italy. Bells are rung from a tower to enable them to be heard at a distance. Church bells can signify the time for worshippers to go to church for a communal service, and can be an indication of a time to pray, without worshippers coming to the church. They are also rung on special occasions such as a wedding, or a funeral service. In some religious traditions they are used within the liturgy of the church service to signify to people that a particular part of the service has been reached. A bell tower may have a single bell, or a collection of bells which are tuned to a common scale. They may be stationary and chimed, rung randomly by swinging through a small arc, or swung through a full circle to enable the high degree of control of English change ringing. They may house a carillon or chimes, in which the bells are sounded by hammers connected via cables to a keyboard. These can be found in many churches and secular buildings in Europe and America including college and university campuses. A variety of electronic devices exist to simulate the sound of bells, but any substantial tower in which a considerable sum of money has been invested will generally have a real set of bells. Some churches have an exconjuratory in the bell tower, a space where ceremonies were conducted to ward off weather-related calamities, like storms and excessive rain. The main bell tower of the Cathedral of Murcia has four. In Christianity, many Anglican, Catholic, and Lutheran churches ring their bells from belltowers three times a day, at 6 a.m., noon, and 6 p.m., summoning the Christian faithful to recite the Lord’s Prayer, or the Angelus, a prayer recited in honour of the Incarnation of God. In addition, most Christian denominations ring church bells to call the faithful to worship, signalling the start of a mass or service of worship. In many historic Christian churches, church bells are also rung during the processions of Candlemas and Palm Sunday; traditionally, church bells are silent from Maundy Thursday through the Easter Vigil. The Christian tradition of the ringing of church bells from a belltower is analogous to Islamic tradition of the adhan from a minaret. Old bell towers which are no longer used for their original purpose may be kept for their historic or architectural value, though in countries with a strong campanological tradition they often continue to have the bells rung. In AD 400, Paulinus of Nola introduced church bells into the Christian Church. By the 11th century, bells housed in belltowers became commonplace. Historic bell towers exist throughout Europe. The Irish round towers are thought to have functioned in part as bell towers. Famous medieval European examples include Bruges (Belfry of Bruges), Ypres (Cloth Hall, Ypres), Ghent (Belfry of Ghent). Perhaps the most famous European free-standing bell tower, however, is the so-called "Leaning Tower of Pisa", which is the campanile of the Duomo di Pisa in Pisa, Italy. In 1999 thirty-two Belgian belfries were added to the UNESCO's list of World Heritage Sites. In 2005 this list was extended with one Belgian and twenty-three Northern French belfries and is since known as Belfries of Belgium and France. Most of these were attached to civil buildings, mainly city halls, as symbols of the greater power the cities in the region got in the Middle Ages; a small number of buildings not connected with a belfry, such as bell towers of—or with their—churches, also occur on this same list (details). In the Middle Ages, cities sometimes kept their important documents in belfries. Not all are on a large scale; the "bell" tower of Katúň, in Slovakia, is typical of the many more modest structures that were once common in country areas. Archaic wooden bell towers survive adjoining churches in Lithuania and as well as in some parts of Poland. In Orthodox Eastern Europe bell ringing also have a strong cultural significance (Russian Orthodox bell ringing), and churches were constructed with bell towers (see also List of tall Orthodox Bell towers). Bell towers (Chinese: Zhonglou, Japanese: Shōrō) are common in China and the countries of related cultures. They may appear both as part of a temple complex and as an independent civic building, often paired with a drum tower, as well as in local church buildings. 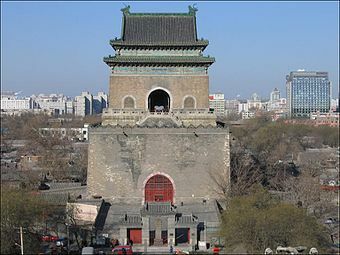 Among the best known examples are the Bell Tower (Zhonglou) of Beijing and the Bell Tower of Xi'an. ^ "25 tallest clock towers/government structures/palaces" (PDF). Council on Tall Buildings and Urban Habitat. January 2008. Archived from the original (PDF) on 2008-10-30. Retrieved 2008-08-09. ^ "Campus tour booklet" (PDF). University of Birmingham. Retrieved 2008-08-09. ^ a b Church Words: Origins and Meanings. Forward Movement. 1 August 1996. Retrieved 16 August 2012. There are two sorts of liturgical bells in the history of the Christian Church-church bells in spires or towers used to call the faithful to worship, and sanctuary bells used to call attention to the coming of Christ in the Holy Eucharist. ^ "The World Carillon Federation (WCF)". Carillon.org. Retrieved 2012-02-19. ^ Matthew: A Shorter Commentary. Continuum International Publishing Group. 2005. Retrieved 2012-08-16. Moreover, the central portion of the Eighteen Benedictions, just like the Lord's Prayer, falls into two distinct parts (in the first half the petitions are for the individuals, in the second half for the nation); and early Christian tradition instructs believers to say the Lord's Prayer three times a day (Did. 8.3) while standing (Apost. const. 7.24), which precisely parallels what the rabbis demanded for the Eighteen Benedictions. ^ Joyce's Finnegans Wake: The Curse of Kabbalah, Volume 2. Universal Publishers. 2009. Retrieved 2012-08-16. The Angelus is a Christian devotion in memory of the Incarnation. Its name is derived from the opening words, Angelus Domini nuntiavit Mariæ. It consists of three Biblical verses describing the mystery, recited as versicle and response, alternating with the salutation "Hail Mary!" and traditionally is recited in Catholic churches, convents and monasteries three times daily, 6 a.m., noon, and 6 p.m., accompanied by the ringing of the Angelus bell. Some High Church Anglican and Lutheran churches also use the devotion. ^ The Anglican Service Book: A Traditional Language Adaptation of the 1979 Book of Common Prayer, Together with the Psalter Or Psalms of David and Additional Devotions. Good Shepherd Press. 9 January 1991. Retrieved 2012-08-16. The Angelus: In many churches the bell is run morning, noon, and evening in memory of the Incarnation of God, and the faithful say the following prayers, except during Eastertide, when the Regina coeli is said. ^ Church Words: Origins and Meanings. Forward Movement. 8 January 1996. Retrieved 2012-08-16. It became customary to ring the church bells to call the faithful to worship and on other important occasions, such as the death of a parishioner. ^ Church Words: Origins and Meanings. Forward Movement. 8 January 1996. Retrieved 2012-08-16. It is also traditional that the church bells ring during the processions of Candlemas (the Feast of the Purification) and Palm Sunday. ^ Church Words: Origins and Meanings. Forward Movement. 8 January 1996. Retrieved 2012-08-16. It is traditional that no bells be rung from the last service on Maundy Thursday until the Great Vigil of Easter. ^ Church Words: Origins and Meanings. Psychology Press. 8 January 1996. Retrieved 2012-08-16. But even for Muslims who pray infrequently, the adhan marks the passage of time through the day (in much the same way as church bells do in many Christian communities) and serves as a constant reminder that they are living in a Muslim community. ^ Islamic Beliefs, Practices, and Cultures. Marshal Cavendish. 1 September 2009. Retrieved 16 August 2012. Muslims living in predominantly Islamic lands, however, have the benefit of the call to prayer (adhan). In the same way that much of the Christian world traditionally used bells to summon the faithful to church services, so the early Muslim community developed its own method of informing the entire community that the time for prayer had arrived. ^ Kathy Luty, David Philippart (1997). Clip Notes for Church Bulletins - Volume 1. The first known use of bells in churches was by a bishop named Paulinus in the year 400. ^ a b Roger J. Smith (1997). "Church Bells". Sacred Heart Catholic Church and St. Yves Mission. Bells came into use in our churches as early as the year 400, and their introduction is ascribed to Paulinus, bishop of Nola, a town of Campania, in Italy. Their use spread rapidly, as in those unsettled times the church-bell was useful not only for summoning the faithful to religious services, but also for giving an alarm when danger threatened. Their use was sanctioned in 604 by Pope Sabinian, and a ceremony for blessing them was established a little later. Very large bells, for church towers, were probably not in common use until the eleventh century.